Polka dancers and accordion enthusiast, listen up! 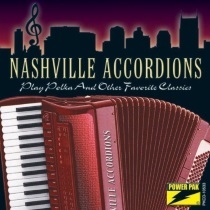 This fabulous collection of songs by the Nashville Accordions is as good as it gets. Having played an important role in Europe’s musical history, the accordion soon became a favorite when it was introduced in this country. Because the accordion has long been the mainstay instrument for polka music, the Nashville Accordions have included their renditions of polka’s most loved songs. Also included are some other traditional favorites that are a real delight when played on this versatile instrument. Check out this all instrumental accordion CD today! Meisner, Steve - Meisner Time!